Please see the instructions on the Events page for more information about applying to participate in Undergraduate Research Week. Click on the Abstracts tab below to learn more about submitting your abstract. Please click on the appropriate guidelines below to learn about preparing your oral presentation or poster for Undergraduate Research Week. If other undergraduate students are co-authors on your project, you will need to list their contact information as well. Be sure all presenters will be available during the presentation/poster times you select. You cannot switch dates/times once they are selected. The abstract title should clearly indicate the nature of the project. In no more than 200 characters (approximately 30 words, including spaces), describe your research in succinct terms, reflecting the contents of your abstract. Use key words, and do not use abbreviations, non-English characters, or symbols. Capitalize the first letter of all words in your title. However, do not capitalize article words such as “a,” “the,” “and,” and “of,” unless the article is the first word of the title. Provide the name(s) of the author(s). Indicate the “presenting” author(s) (meaning you and any other authors who will present the work at Undergraduate Research Week) by writing these names in ALL CAPITALS. If it is appropriate to your discipline to list your faculty mentor as an author, you should list your faculty mentor as the last author. (Be sure to ask your faculty mentor if you are not sure!) Do not include titles or degrees such as Dr., Ph.D., etc. Please note: There can be no more than four undergraduate presenters (including you) for every original abstract submitted, and the same abstract cannot be submitted multiple times. Your abstract must be at least 100 but no more than 1550 characters (approximately 225 words). The abstract should include introductory/background information, your argument or research question, the methods employed, and your results or conclusions. End the abstract by stating the significance of your research. Do not use symbols, non-English characters, italicized or boldfaced words, references, figures, or tables in your abstract; the online submission system does not support them. Symbols and non-English characters will appear as empty boxes; italicized and boldfaced words, as well as references, figures, and tables, will be formatted incorrectly. The Undergraduate Research Center–Humanities, Arts, and Social Sciences hosts abstract workshops to help you write abstracts for Undergraduate Research Week, as well as other conferences. We encourage you to attend! Due to space limitations, students applying to give oral presentations must first have been nominated by their departments. Students who have been nominated will receive email notifications of their nominations in March. All students giving oral presentations at Undergraduate Research Week should prepare 7-8 minute presentations. Be sure to rehearse and time yourself to make sure your presentation does not exceed the time allotted. For many students, a 7-8 minute presentation, typed out in 12-point Times New Roman font, will be between 3.5 and 5 double-spaced pages. The oral presentations will be organized into 1-hour panels. This means that you will give your presentation during an assigned 1-hour time spot along with a group of other students on your panel. Each panel will have a moderator, and time will be allotted at the end of the panel for questions from the audience. Attend one of the presentation workshops in spring quarter to help you prepare your oral presentation for Undergraduate Research Week and other conferences! No RSVP required. 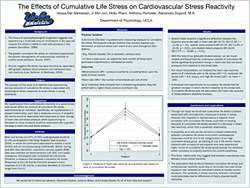 All UCLA undergraduate students engaged in research and creative projects are encouraged to present posters at Undergraduate Research Week. Guidelines for creating a research poster are below. For students in the arts, a poster may be broadly defined as a visual display of creative work. Attend poster workshops to help you learn how to create a poster for Undergraduate Research Week and other conferences! No RSVP necessary. A research poster is an organized, visual display of your research project. 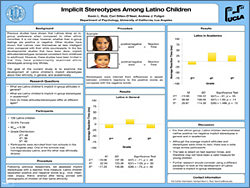 Typically, you present your poster in a poster session at a conference or seminar. 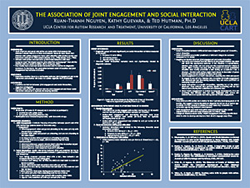 Conference or seminar attendees will walk by your poster, study its contents, and ask you questions. You should be prepared to answer questions and to explain your project one-on-one frequently throughout the poster session. Presents your research in an organized and visually pleasing way. 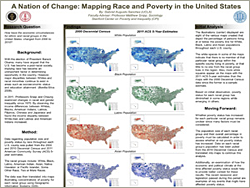 Posters typically contain both text and graphics (charts, tables, lists, etc.). Is self-explanatory. In the case that you aren’t standing by your poster, or if you are otherwise engaged in conversation, anyone walking by should be able to view your poster and understand your project. Is easy to read. Be sure your text and graphics are large enough that multiple people standing a few feet away can read your poster simultaneously. Is concise. Your poster should summarize your project quickly and efficiently. Avoid long paragraphs. Bullet points are often very effective. Figure out how you might present parts of your project through graphics. You should be able to explain your poster from start to finish in ten to fifteen minutes. Identify the main points of your research project, and then determine how you might present this information graphically or with short texts blocks. See below for sample poster design templates. Be careful of using too much text; your audience members may only have a few minutes to look at your poster. Also, your audience should be able to read your poster from about 4-5 feet away, and once you enlarge the font size, you don’t have much space! Title: Your title should be brief but descriptive. It should be the same title as provided on your abstract. Be sure the title is readable at a distance of 4-5 feet away. Suggested font size is 72 point or larger. Author(s) and Institution: The first name should be the name of the poster presenter; after this, the authors are listed in the order of contribution to the work. If it is appropriate to your discipline to list your faculty mentor as an author, you should list your faculty mentor as the last author. Below the author(s), include the department that houses your work and the university name (UCLA). Introduction or Background: Present any introduction, background, or context necessary for the reader to understand your poster. Start with a general introduction to the field, and indicate the relevance of your work. Hypothesis, Argument/Thesis, or Research Question(s): Clearly state your hypothesis, argument/thesis, or research question(s) based on the background information that you provided. Methodology or Approach: State briefly your methodology for answering your hypothesis/research question(s) (e.g. experimental methods) or your approach to crafting your argument/thesis (e.g. theoretical, disciplinary, etc. approach). You do not need to go into great detail here; it is often better to include details in figures or graphics. Figures or Graphics: Here you present the data or components of your project in visual form. You might include graphs, tables, lists, photographs, illustrations, diagrams, or other relevant graphics. Typically, each of your figures or graphics will have a title. If it is appropriate, you should also include a legend for each figure or graphic. Results, Discussion, and/or Conclusions: Here you state the results and conclusions of your project. You should also indicate the significance of your project: what knowledge has your project added to your field? If it is appropriate, mention any alternative explanations for your results and possible explanations for unexpected results. Future directions: If it is appropriate, state what you plan to do next on your project. Do your conclusions lead you to new questions? Are you considering new methods to answer your original questions? Acknowledgments: If your research is funded by a scholarship program, you must acknowledge the program. It is also recommended that you acknowledge those who contributed to your research and/or those who mentored or assisted you with your research. References: List all sources that you cite in the various sections of your poster. You should list your sources using the citation format appropriate to your discipline and project (MLA, APA, Chicago, etc.). Print as one sheet: Use PowerPoint or another program to create a poster that can be printed out on a single large sheet of paper. Poster printing locations and rates are below; be sure to ask your faculty mentor or scholarship program if poster printing funds are available. See also the creating a poster using PowerPoint instructions. Print sections: Print the sections of your poster yourself on standard printer paper (8.5″ by 11″) then attach each section directly to the poster board. Arrange the sections into columns and rows to form your poster. Your poster should be easily readable from at least 4-5 feet away. Suggested font sizes are at least 72 point for your title, 48 point for your headings, and around 36 point for your text. Do not use script fonts that are difficult to read. Use color. You want your poster to catch your audience’s attention while looking streamlined and professional. You might use color on graphics, headings, text blocks, borders around text, etc. Posters are typically read from top to bottom then left to right. For students wishing to have their posters printed, please see this info sheet regarding campus printing locations and rates.